The use of technology to deliver instruction is an idea whose time has come – though the extent of its use varies greatly. At some institutions, professors do little more than use learning management systems to record attendance and grades and to communicate with students. At the other end of the scale, millions of students study entirely online. For the great middle, though, professors are increasingly using their LMS and other technology tools to do things that don’t simply replace paperwork. They are bringing together students from across the country or around the world. They are “flipping the classroom” and using class time for group work or student presentations, rather than for lecture. They are using simulations, videos and an ever-growing list of tools. And they are doing so in courses that are entirely online, entirely in person and in hybrid formats. 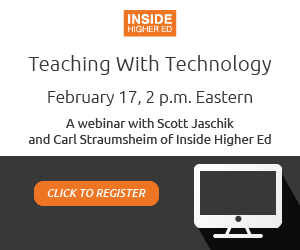 Join Inside Higher Ed editor Scott Jaschik and technology reporter Carl Straumsheim for a lively discussion on these issues in this free webinar. Click here to download the accompanying slide deck, and visit insidehighered.com/booklets  to download Teaching with Technology, a free booklet of news articles on this important topic. Inside Higher Ed’s Teaching with Technology webinar is made possible with the support of Blackboard .